Disclaimer: I am writing this from memory as I did this some weeks ago. I cannot guarantee that this will work out, nor I can guarantee that this does no harm to your computer. I cannot be held responsible for any inconveniences, crashes or loss of data you may experience due to this instructions. Here’s a step by step guide to help you making the necessary changes. Download and the archive from here and extract it to an empty directory. Open the file W1254624J_XP32SMAXWDMW2K_XPADIHdAud.inf in a text editor, e.g. Notepad. Installing is a bit more complicated. First of all, you will need administrator privileges in order to install the driver. Moreover, note that I’m using a German Windows XP installation and I don’t know the exact English versions of the labels. So take my translations with a grain of salt. The easiest way would be to use the provided W1254624J_XP32setup.exe – you may want to try that first. Double click the file to start and follow the instructions on the screen. Click on “Start” -> “System Settings” to open the System Settings dialog. Open the System window. If you have the categorized view enabled, click on “Performance and Administration” followed by the “System” symbol in the bottom right. If you have the classic view enabled, just click on “System”. The System dialog should pop up. In the System dialog, click on the “Hardware” tab and click on the “Device Manager” button. The Device Manager dialog should pop up. Open the tree item “Audio-, video- and game-controllers” and double click on the “SoundMAX Integrated Digital HD Audio” item. A properties of “SoundMAX…” dialog should pop up. Click on the “Driver” tab, then click on “Update…”. An Update-Wizard should pop up. In the wizard, chose “No, no this time” in order to prevent Windows from searching online. Click on continue. On the next wizard page, chose the second option, “Install software from list or specific location” or something like that. Click on continue. On the next wizard page, chose the second option again, “Don’t search…” and click continue. On the next wizard page, you should see a list which contains one item “SoundMAX Integrated Digital HD Audio”. Select this item, then click on the “Media…” button below the list. A “Installation from medium” dialog should appear. Click “Browse…” to browse for the installation file. A file dialog should pop up. Browse to the directory where you extracted the archive to and chose the W1254624J_XP32SMAXWDMW2K_XPADIHdAud.inf file there. Click “Open”. Now that the file is selected, click “Continue…” and follow the onscreen instructions. The new driver should get installed. That should pretty much be it. Let me know if you have any questions or remarks. Thank you for sharing your experience. I tried your instructions step by step and was able to get stereo-mix. But I still could not record. I am wondering if you were able to record fine. Any help is greatly appreciated. Yes, I am able to record fine. Are you sure you have Stereo Mix activated as the recording device? I think so, I used audacity and another app called SuperMp3recorder. I selected StereoMix as the input device but wasnt able to record. The volume was set to max. Is that what you meant by activating? I meant selecting it as a recording device as shown in the screenshot above or likewise in other apps. It appears that you did that, so unfortunately I’m out of ideas right now. Do you know if these drivers work in the same way with a ThinkPad X61? When I tried doing this, it discouraged me from doing the upgrade by giving me a bunch of warnings that the laptop might stop operating normally. I have no restore or backup CD and that is why I am reluctant to do the above steps. NS, sorry, I cannot say whether it works with a Thinkpad. I went ahead and did all the above to my drivers. I can now see Stereo Mix as an option but still cannot record! I made sure Stereo Mix was selected when I was trying to record but this was of no use at all!! Hello. I have tried what you said. 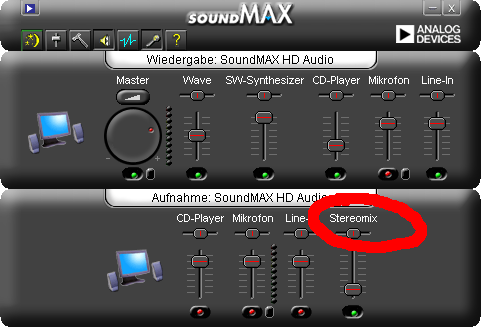 I have Stereo Mix on recording devices, but nothing is recorded, even Stereo Mix is selected. I am using CoolEdit Pro. I’ll add my woes to the mix — I followed these steps as well, and am still unable to record. “Stereo Mix” is available, and selected, with volume turned up. Still, I only get silence when recording with several programs; Cubase, Audacity, Windows Sound Recorder, Fraps. I’m not commenting to seek help, just sort of throw my experience into the mix to add to these other people experiencing the same issue. Oh well! Thanks for the walk-through anyhow. whoever figures how to record with soundmax card and actually get sound, will become famous lol. This isn’t the problem I’ve been having with my SoundMax drivers. When I install them, I have StereoMix from the beginning, yet when I set it as the recording device and turn it up even slightly, its maxes out the volume levels and makes some type of horrid feedback that I’ve never seen before. I honestly despise these sound drivers. You have no flipping idea how much I love you now. Yezz! It works just great! I’ll join in the unlucky crowd. I installed these drivers, have Stereo Mix in SoundMax HD panel and selected Stereo Mix in the recording software (Fraps) but no sound. After a long search I ended up here, I am running windows vista with Soundmax Integrated Digital HD Audio, driver version 6.10.1.6030. I downloaded the driver again from my laptop manufacturer and changed every “Disable Stereo Mixer” value of ’01’ to ’00’ (around 6 of them in the ‘ADIHdAud.inf’ file. Deinstalled the drivers then rebooted, quickly installed the driver and stopped the windows automatically driver install (quickly accessing task management ctrlaltdel and ending the process) then ran the setup. I now can use the feature ‘stereo mix’ by unhiding it and activating it in configuration/sound/recorddevices. Good stuff. Thank you very much! Thank you for outlining the problem I’m trying to solve so well. I notice you posted nearly 2 years ago so maybe I’m too late. I’m very frustrated. I’ve written some language lab software that requires a stereo Mix or “Ce que vous entendez” (“Was sie hören”? excuse my German if that’s wrong)input but the computers in the school where I’m testing only have Microphone or Line In. They are Dell computers with SoundMax HD cards. I thought your information looked promising and I downloaded the zip from Asus FTP but it doesn’t seem to contain any drivers and I can’t find anything called v5.10.1.6240. Am I missing something? Will it work with dell gx-520 soundcard? OMG Thank you sooo much ! I am so happy I would kiss you right now 😀 Finally, it works ! Thnaks for the magic solution. At first my system running XP with Asus mobo P5B Delux where all driver is provided. When I use Audacity to record sound any of the available sources, it will failed to capture sound, be it in Stereo mix or CD Player… Using Audacity to import sound file & play got no problem. After reading your posting I follow your step. It works after uninstall current soudmax driver & re-install the version with modified on stereo mix feature. My Audacity now can record sound playing thru this pc. Brilliant – it worked for me on my Dell Optiplex 745. Can now record fine using Audacity. I found four places in the driver that I changed (don’t forget the change from 1 to 0 as well as the change from Disable to Enable). Ignore any warnings that the driver is incompatible, just keep going to install the amended driver. Setup.exe didn’t work because it thinks the driver is incompatible so do it manually, as Matt describes. I got stuck in trouble after changing the bios battery. SoundMAX proposed a driver update – I did and got the BSOD. After two days of struggling I found your post, followed your advice, and everything works fine now.